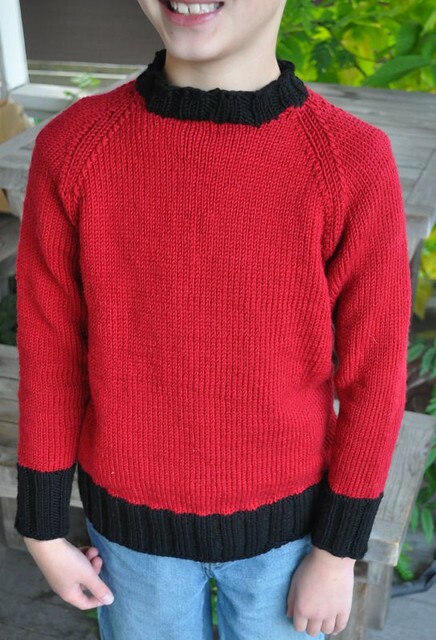 Notes: Younger son wanted a plain red raglan pullover with black edging. His chest measures 26" but most of his shirts were around 33" so that's the size I aimed for. I used Jeny's Surprisingly Stretchy Bind Off for the neckline and it's very elastic. I think, looking at the pictures that the sleeves are a bit too slim given the amount of ease in the body and will be too short on him soon. I should stash more of the red so I can rip the sleeves out in a while and knit them longer for him. As you can see in the photo he is pleased with the sweater. The smile is priceless. He looks like he loves the sweater. Great sweater...I'd be tempted to make the black longer rather than the black. Then you can lengthen the body AND the sleeves! Having two boys I would say with confidence that he will probably outgrow the sleeves quickly. But he will love it with a fierceness until then - you can tell!